Add 4 cups half & half and 4 cups of water. Then add two 6 1/2 oz cans of undrained minced clams. Now add your chowda mix. Bring this to a slow boil and simmer until potatoes are soft (about 30 to 35 minutes). As part of a gift package from our sister church, Mashpee United Church of Christ, we received a package of your Clam Chowda Mix. After searching your website I prepared it with help from the reviews. Being in Iowa we are not normally exposed to great sea food recipes, however this one had rave reviews from all who appreciate clam chowderrr, midwestern dialect. I will be ordering some soon because of the requests of the members of the congregation. Best I've found that I can make at home! I went to the Big E in West Springfield Ma., where I first tried Amelia's Chowda Shack clam chowder. I loved it so much I bought some to make at home. Now I'm hooked! I think I'll try making it with heavy cream and chiken stock as someone else posted. I'm going to serve it at Christmas dinner and offer a package to my guests. I just placed my order for more. GREAT PRODUCT!!!! My family really liked this chowder. I substituted heavy cream for the half & half and I always use chicken stock instead of water. 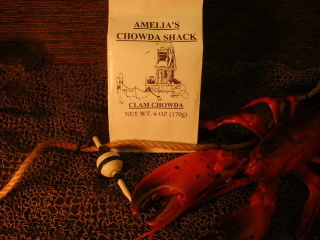 I finally found a chowder that tastes like what I had in Martha''s Vineyard. I tweaked the recipe as well, I added 3 half-cooked potatoes at the beginning of the simmer, also subbed one cup milk instead of the water. Took a lot longer to get it thick the way we like it but it was worth it. Will have to try the chicken stock thing next time too. Got it from the Big E, glad I found it online, will be ordering more.